HTC Desire 510 is among the first devices to utilize the next generation of mid-range chipset with a 64-bit processor - the Snapdragon 410. The new chip offers a snappy quad-core Cortex-A53 CPU running at 1.2GHz, Adreno 306 GPU and 1GB of RAM. We've met with plenty devices powered by the highly popular and widespread Snapdragon 400, so we are definitely eager to see the progress of its successor. As usual our first benchmark - GeekBench 3 - gauges the CPU performance. As it turns out the new Cortex-A53 cores clocked at 1.2GHz are 25% faster than the older Cortex-A7 running at the same frequency, and on par with the Cortex-A7 ticking at 1.6GHz. The 25% performance boost and the new 64-bit instruction set are definitely a worthy upgrade by our books. AnTuTu 5 is a compound test taking in consideration the on-screen GPU performance and the storage speed as well. The HTC Desire 510 is better than every Snapdragon 400 device we've tested to date, though the margin isn't that high and a part of it is certainly due to the lower FWVGA resolution compared to the qHD and HD competitors in our chart. The cross-platform BaseMark OS II tests even more - it adds the browsing performance to the already lengthy performance equation. Somewhat surprisingly however the HTC Desire 510 is running on a lower-resolution display, a newer generation chipset and faster Android KitKat, it did quite poorly on this test. The single and multi-core CPU scores of the BaseMark OS II test are very good though - a hair better than the Cortex-A7 quad-core CPUs running at the same 1.2GHz. The Snapdragon 410 chipset comes with a minor upgrade over the GPU - it now uses the Adreno 306, which as the name suggests isn't a great deal faster than its Adreno 305 predecessor. The HTC Desire 510 has some advantage over the onscreen tests because it has a lower FWVGA resolution (just like the Sony Xperia E3), but the offscreen benchmarks will show us the real difference. The HTC Desire 510 indeed did great on both T-Rex and Manhattan on-screen tests. In its own price range it was bested only by the Adreno 305 in the FWVGA Sony Xperia E3 on the T-Rex test, but the Desire 510 had the same output as the Xperia E3 on the new OpenGL 3.0 Manhattan benchmark. Unfortunately the raw performance of the Adreno 306 turned out mostly the same as its Adreno 305 predecessor judging by the offscreen tests. The GPU intensive BaseMark X came up with a promising score for the Adreno 306 in the HTC Desire 510, better than the rest of the S400 gang but not the second generation Moto G (2014). HT Desire 510 is a snappy smartphone with smooth UI navigation and performance better than the low power consumption of the chipset would make you expect. It is ready for the next generation 64-bit Android apps, where the hardware upgrade will count even more. 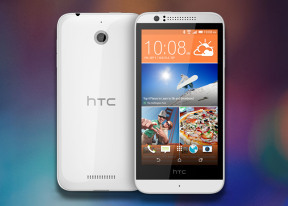 For now the HTC Desire 510 offers a solid user experience that should be enough to please non-power-users. And it should get even better in the future once Android 5 Lollipop with its ART runtime and 64-bit apps hits it.